The second Vatican Council was convened by Pope John XXIII between 1962 and 1965. It marked a fundamental shift toward the modern Church and its far-reaching innovations replaced or radically changed many of the practices, rules, and attitudes that had dominated Catholic life and culture since the Council of Trent in the sixteenth century. 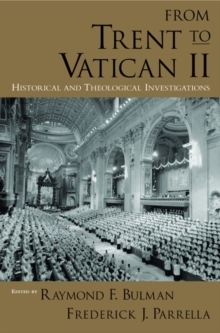 In this book a distinguished team of historians and theologians offers an impartial investigation of the relationship betweenVatican II and Trent by examining such issues as Eucharistic theology, liturgical change, clerical reform, the laity, the role of women, marriage, confession, devotion to Mary, and interfaith understanding. As the first book to present such a comprehensive study of the connection between the twogreat Councils, this is an invaluable resource for students, theologians, and church historians, as well as for bishops, clergy, and religious educators.